How does a fish cross the road? Partly to answer this question, in 2010 FRWA started a three year project in upper watershed towns, chiefly Becket, Otis, and Sandisfield. 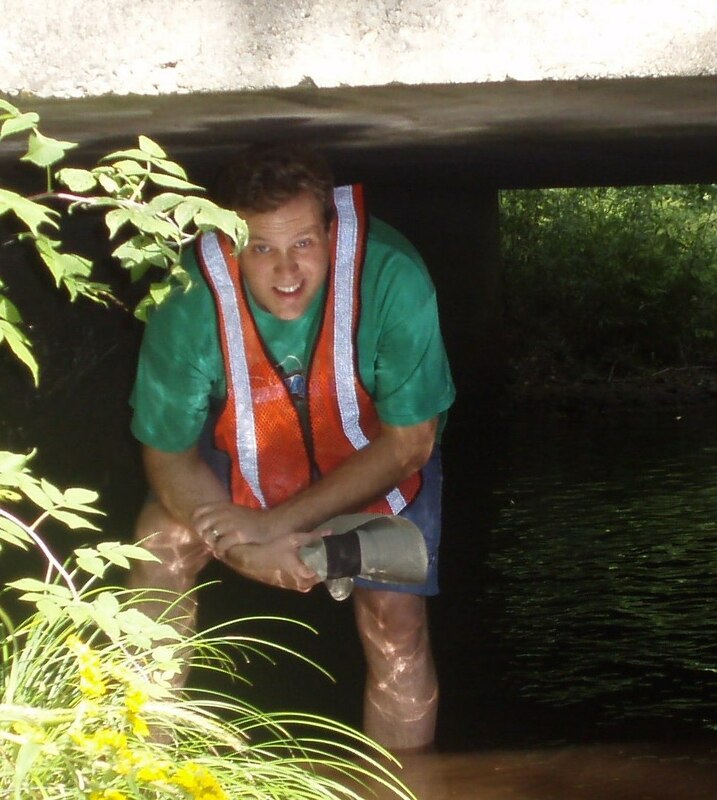 Our mission was to address recommendations by the MA Department of Ecological Restoration and the Berkshire Regional Planning Commission for documenting water quality and fish habitat in the headwaters of the Farmington. 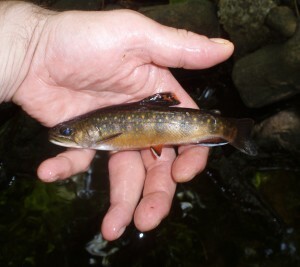 A primary goal is to spot stream crossings that bar fish travel. 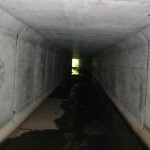 Structures such as culverts, conveying a stream under a road, sometimes sit too far above the streambed for fish to navigate—especially species that are poor jumpers. 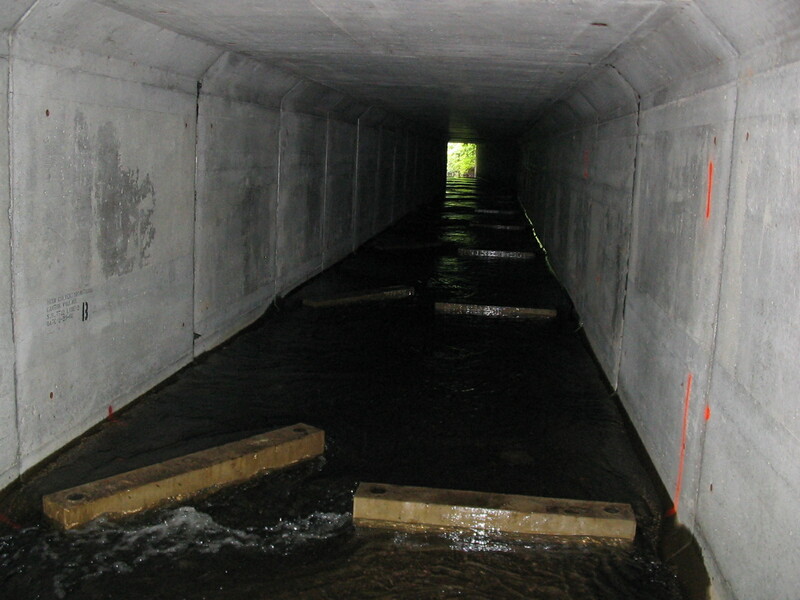 “Perched” culverts can cut streams into isolated segments that are too small and too vulnerable to ensure good long-term survival for stream animals. Documenting problem crossings is a first step toward installing a better one, when the time comes for replacement. 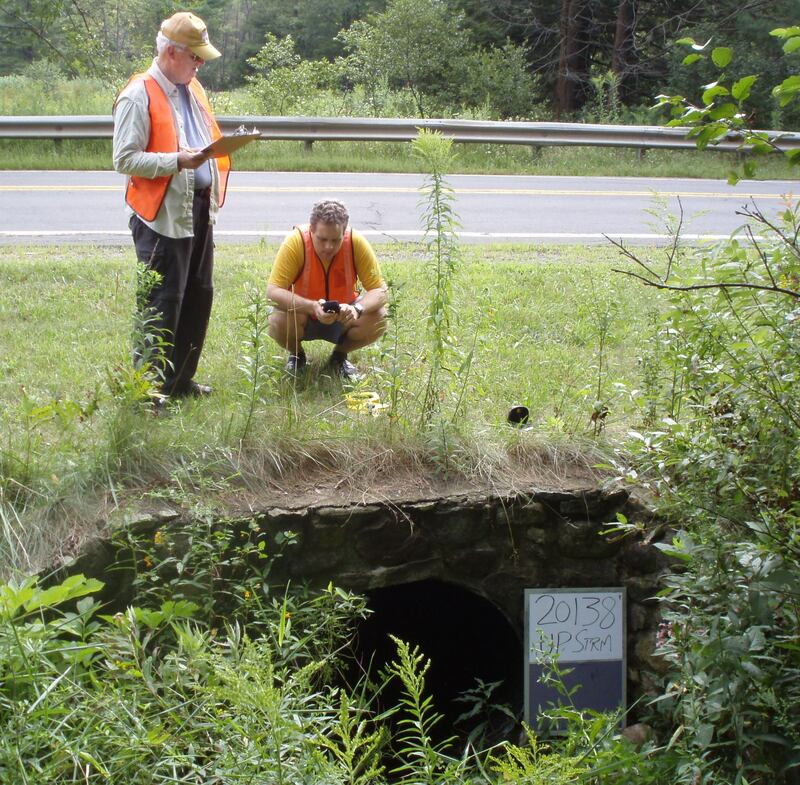 In 2010, summer staffer Mike Jastremski, intern Hart Rotblatt, and volunteer Jerry Eaves from Pioneer Valley Trout Unlimited hit the roads in Massachusetts. Using a survey method practiced throughout the state, they evaluated about 60 crossings. In 2011, the work was taken up by Alison Dixon (who also works for the Housatonic Valley Association), again helped by Jerry. Our other project partners include Carrie Banks of the Massachusetts Riverways Program and Scott Jackson of UMass Amherst for training, as well as David Carlow and Meshell Bordeleau for hosting us at Tolland State Forest, plus all who gave of their time to talk with us over the seasons. Additional help came from the Housatonic Valley Association and the Berkshire Environmental Action Team. This project is funded by the Massachusetts Environmental Trust, which is supported through the purchase of Massachusetts environmental license plates. From 2005-2007, FRWA participated in two culvert passage projects with the CT Department of Environmental Protection Fisheries program. Both were funded by the U. S. Fish & Wildlife Service. Labor was provided by CT DEP and logistical support by FRWA. Sandy Brook in Colebrook has valuable upstream habitat for fish coming up from the Farmington River—it is even a stocking site for Atlantic salmon fry. But there was a problem: a bridge over Sandy Brook includes a bank-to-bank concrete apron to stabilize its footings. The apron covers the native streambed, and flow over the concrete is too shallow, uniform, and fast for good fish passage. Also, a vertical drop at the apron’s downstream lip obstructed fish coming upstream. So rebar cribs, welded together to form a grid and filled with rocks, were installed to deepen and break up the uniform shallow flow. Half of the stream bank was blocked off to further concentrate and improve flow. The cribs, and a rock ladder into the apron, were installed in August 2006. In September 2007, more rock was added to replace rocks that washed out in the floods of April, 2007. 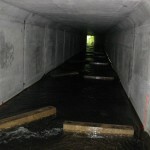 Both the Nod Brook and Sandy Brook sites are inspected periodically and maintained as needed.